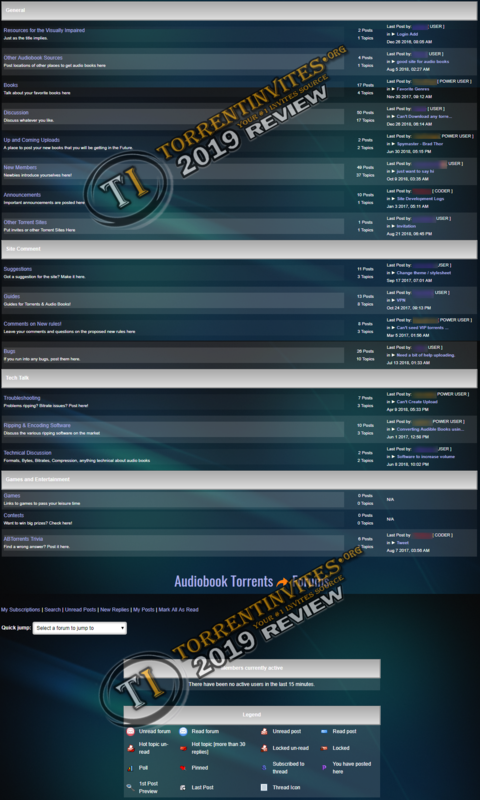 ABTorrents (ABT) is a well-known private tracker for Audio Books with plenty of hard to find content and unique uploads. It has a lot of torrents in various categories such as : Business,Comics,Computers,Comedy,Science,History,C hildren,Biographies ..etc. Considered the premier audiobook torrent location on the web. Their torrents is better seeded and gets better releases. Got active community with nice requests section that are being filled as soon as possible which makes the forums are active as well. It's a good tracker with some great contents but sadly it lacks seeders. ABT is Highly recommended to any audiobookphiles where it's stuffs couldn't be found nowhere else . This makes ABT a very valuable site to have if you are looking to seed some other sites with audiobook sections. TheTrader, kirill, Yokel and 2 others like this.